More than a dozen Rohingya refugees abandoned by people smugglers have been found in a southern Thai forest, police said Wednesday, almost a year on from a crackdown which has forced traffickers to find new routes. Muslim Rohingya, an ethnic minority from Myanmar's western Rakhine state who are forced to live in apartheid-like conditions, have for years fled their homeland seeking work in Muslim-majority Malaysia. "Fourteen Rohingyas, including kids as young as a few years old, were found at around 6am (Wednesday)," police captain Panuwat Chomyong, a highway officer in central Chumpon province, told AFP. Smugglers abandoned the group ahead of a police checkpoint, Panuwat said, adding they had initially entered Thailand through Kanchanaburi province, a much more northern entry point than those usually used by traffickers. The discovery suggests new routes are being sought by migrants and smugglers following Thailand's belated crackdown on the grim and lucrative trade last May which has seen boat crossings over the Bay of Bengal almost entirely cease. For years Thailand turned a blind eye to well-worn trafficking routes in the deep south that carried tens of thousands Myanmar Rohingya refugees and Bangladeshi migrants over the border into Malaysia. Human rights groups said officials both ignored and benefitted from the trade. 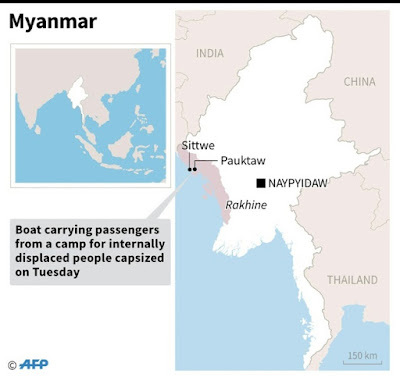 Most victims crossed the sea in rickety boats to be held in remote jungle camps where they were beaten, raped and abused until relatives paid release ransoms. They would then be moved to Malaysia. The Thai crackdown saw more than 90 alleged traffickers arrested -- including a senior general -- and sparked a region-wide crisis as smugglers abandoned their cargo in jungle camps and at sea. The dangerous sea crossings have since largely stopped and are unlikely to increase over the next few months with monsoon season approaching. The group intercepted by police Wednesday was the first major discovery of Rohingya migrants in Thailand in many months, suggesting the flow has reduced to a trickle, though investigators say new ways into Thailand are being sought. 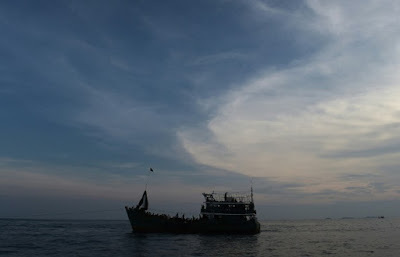 "Navy and marine police are strict along the borders of Myanmar now -- so I've noticed that most Rohingyas are going by overland routes now," said Panuwat. Police said the group began their journey in Mottama town in Myanmar's eastern Mon state which does not have a Rohingya population. But it is a city close to one of the main border crossings between Thailand and Myanmar and a frequent jumping off point for journeys east.